Turning a real estate website or any type of website into a viable source of income producing tool takes a lot of work. There are no short cuts or simple optimization strategies that can catapult a website to the top, although there are many people who think so. There are many factors to climb to the top of search engines and one of the clearest ways is by providing good, relevant and useful content which in most cases means good web pages that are helpful for the users. This brings me to the purpose of this post which is the recent addition of two such communities/pages, one is The Meadows in Bristow which is located at the south end of Bristow, Virginia and the second is the community of Glenkirk Estates in Gainesville, Virginia. 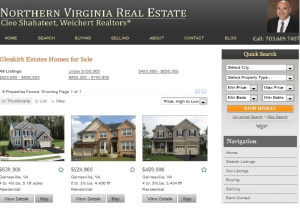 This is a good way of providing useful content as well as providing anyone interested to view listings of homes for sale in any particular community. You can visit my website and get this information in the right hand menu which eventually will have most, if not all, communities in Northern Virginia, but as I mentioned previously this takes time and I will work expand my radius as time goes on. As of now Bristow is near completion which will be followed by Gainesville and Manassas, Va.